What’s better than a six ingredient dinner? One that cooks in slow cooker. These Slow Cooker Shredded French Dips are the ultimate of easy dinners that will make for a smooth weeknight. 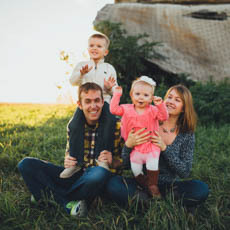 **This post was originally shared in 2011 and remains a family favorite so it’s time to give it some love and bring it the attention it deserves again. Photos, text and the recipe itself have been improved and updated. As a food blogger, I make so many different things that we rarely have the same thing twice. It leaves Joel begging me to make “that one thing you made three months ago” or it’s been so long the family thinks it’s a completely new recipe. I know normal people keep quite a few things on rotation and sometimes I wish I was better at that. It would definitely make for easier meal planning. But I get bored easily and don’t like eating the same thing often so the food blogger life is fitting for me. But there are a few recipes that are an exception to the rule and these Slow Cooker Shredded French Dips are definitely one of them (along with this spaghetti sauce and sloppy joe’s). With fall just around the corner I knew it would be the perfect time to revamp and share these again. They are warm and hearty and filling. Perfect for game day or a busy weeknight filled with activities. All you need to make these bad boys are 6 ingredients. Seriously. And you know what you do with those ingredients? Dump them in a slow cooker and walk away. Then you come back 8 hours later, shred the beef and throw it on a roll with some cheese. And the bread and cheese count towards the six ingredients people. Now you know why this is a favorite of mine. It could not get any easier. They don’t just have ease of preparation going for them though. They taste great too. The beef cooks in a super concentrated, beefy broth which adds a ton of flavor and richness. I don’t normally like anything soggy (cereal especially) but this sandwich is one of those things that has to be soaked in sauce. I mean, to the point of it running down your arm when you take a bite. 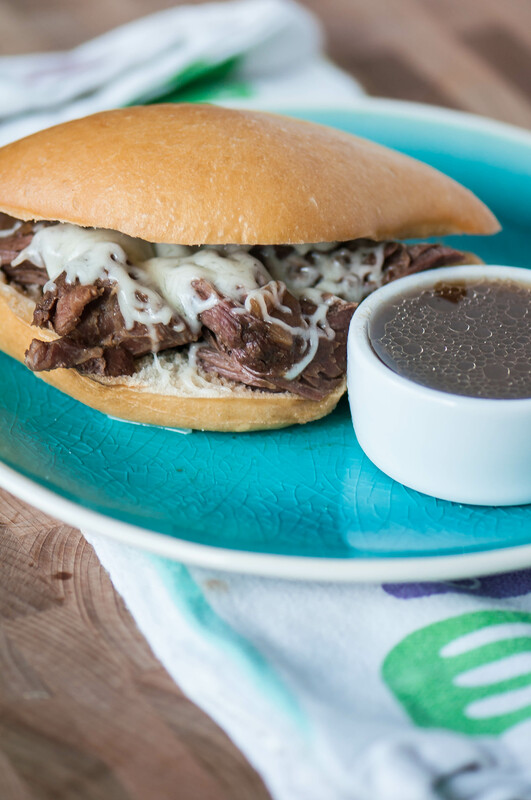 It’s kind of the only way to eat a french dip. This sandwich brings back childhood memories as much of the food I make does. French dips were always a family favorite growing up and we would eat them often. When my brother was little, he used to call the au jus “rah jus.” Maybe it was a speech thing, maybe he thought his name was cooler but I always think of that when I make these. Tasty food filling tummies and bringing back memories. Doesn’t get better than that. Place chuck roast in the bottom of a slow cooker. Pour French onion soup, 1/2 can beef broth (just eye ball it) and beef consomme over the roast. Stir slightly to make sure the soups are combined. Cook on low for 8 hours. Remove chuck roast from slow cooker and shred with two forks. Slice rolls in half and fill with shredded beef. Top with sliced provolone and melt under broiler or in the microwave. Serve with a au jus (broth from slow cooker) for dipping. I sure wish that I had this great French Did Sandwich in front of me right now, it would be so good! Thank you so much for sharing with Full Plate Thursday. Hope you are having a great day and come back soon!